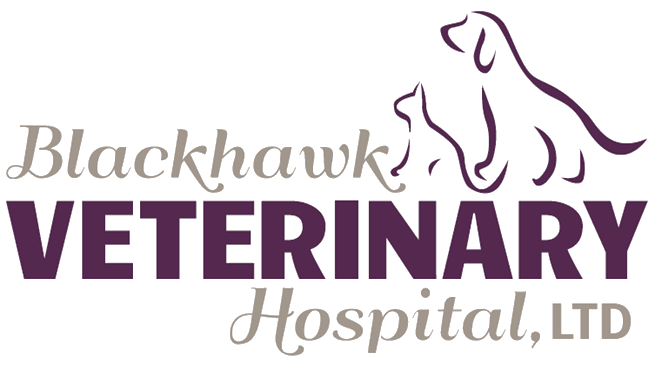 Blackhawk Veterinary Hospital would like to take this opportunity to welcome you to our website. Our goal has always been to assemble a veterinary health care team committed to providing compassionate care and exceptional client service. Take some time to explore our site, we will be adding more content and photos in the future. If you have any questions, please call one of our staff members, or send an e-mail if you prefer. Dr. Williams completed his Bachelor of Science in Biology at Kansas State University in 1990. He went on to attend Kansas State University College of Veterinary Medicine and was awarded his DVM in 1994. He purchased Blackhawk Veterinary Hospital in October 1999, after working as an associate veterinarian with small animal hospitals and Duluth, MN and Champaign, IL. Dr. Williams enjoys all aspects of medicine and surgery but has special interests in dentistry, and dermatology. 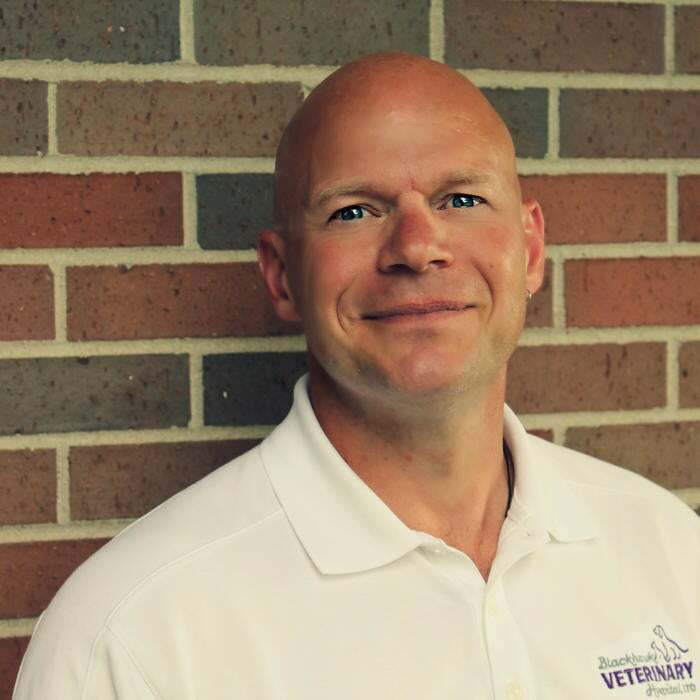 Dr Williams is currently involved in a number of professional organizations including the American Veterinary Medical Association, Wisconsin Veterinary Medical Association, Milwaukee Veterinary Medical Association, and the Rock Valley Veterinary Medical Association. He was past president of the Wednesday morning Janesville Optimist Club and has served on the Board of Directors for the Rock County Humane Society. Away from work, during warm weather, you may see him riding his motorcycle or driving his 1967 Datsun roadster. You may run into him at the gym or at the library. He and his wife, Tammy enjoy traveling and every year they participate in the Susan G. Komen 3-Day for the Cure walk. 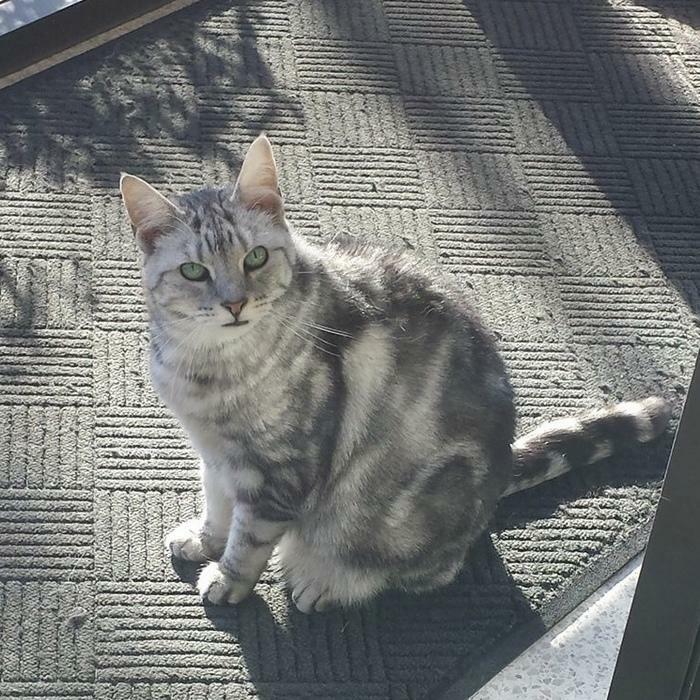 The other members of the family include Mildred, the English Bulldog; Scout, the French Bulldog; Quarter and Angus the cats; and George a Quaker parrot. 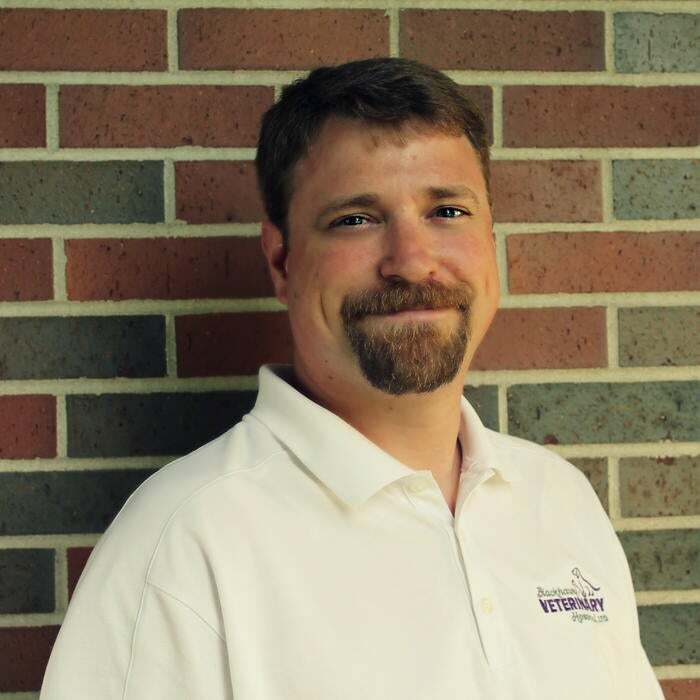 Joe Utrie, DVM completed his Bachelor of Science in Biology/Chemistry at the University of Wisconsin, Whitewater. He received his DVM degree from the University of Minnesota in 2006. Dr. Utrie joined our hospital in 2008. Dr. Utrie enjoys all aspects of small animal medicine and surgery and has a special interest in veterinary behavior. Dr. Utrie is a member of the American Veterinary Medical Association and the Rock Valley Veterinary Medical Association. During his time away from work, Dr. Utrie enjoys music, reading and spending time with his wife and son, their dog Beckett, and cats; Jarvis, Deacon, and Paka. Julie is a Certified Veterinary Practice Manager. Julie has worked for Blackhawk Veterinary Hospital since 2004. Julie received her veterinary technician certification in Scottsdale, AZ in 1999. Julie is proud of the work she and her staff have accomplished. She feels Blackhawk Veterinary Hospital provides quality medicine and a level of customer service which clients appreciate and have come to expect. Julie shares her home with her husband, children; their dogs Halas and Danny; and two cats, Cannonball and Leo. 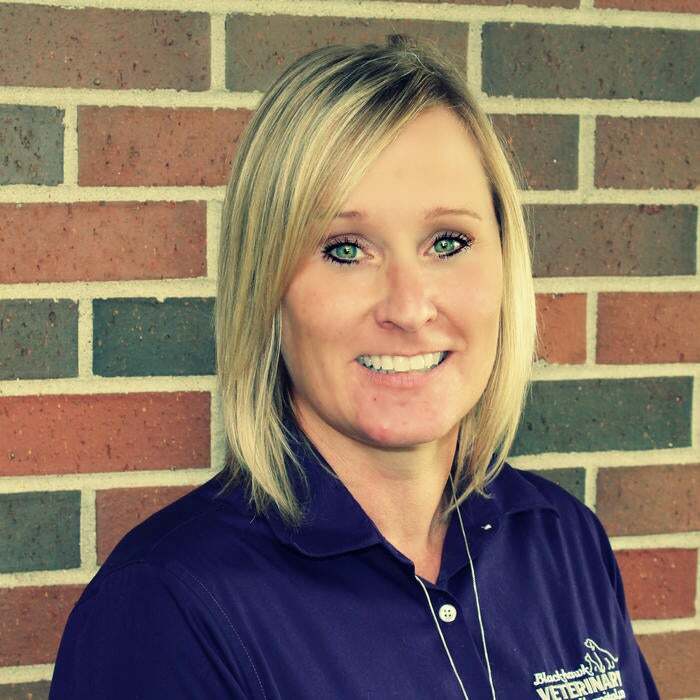 Julie is involved with The Veterinary Hospital Managers Association, the Membership Committee of the VMHA, the Chicagoland Veterinary Practice Managers Association, and the Wisconsin Veterinary Practice Managers Association. In her spare time, she works with 4-H and many community activities including Relay for Life. Heidi is a Certified Veterinary Technician. She became certified in 2008 and has worked for Blackhawk Veterinary Hospital since 2015. 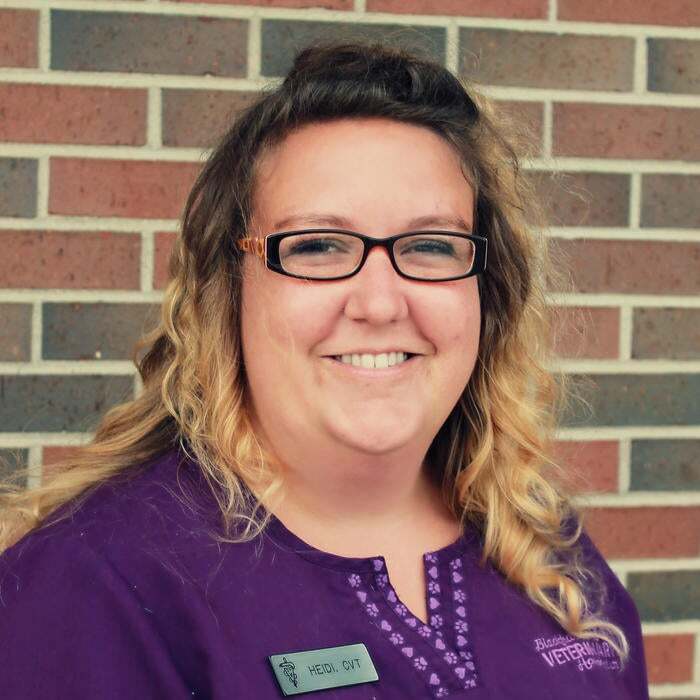 Heidi enjoys nursing care and laboratory tech work. She shares her home with her dog Maggie; three cats, Sherbert, Mertle, and Gertle; and a fish, Warren Z. She enjoys hiking, fishing, rock hunting and spending time with friends and family.